I had the curry sauce on its own with the fish and accompanied it with a Be Good to Yourself Naan Bread (3sp) but you could also serve this with rice (my hubbie had his with 60g wholegrain basmati rice for another 6sp). Either way, be sure to add the extra points. Because this serves 4, the hubbie and I also had this for lunch the next day at work and instead of fish, I added 100g of roasted chicken, shredded before I warmed it up. Perfection! If you like your curries hot, use a nice hot chilli such as a scotch bonnet. If not and you like a medium heat, go for a regular red chilli. If you are more of a mellow fellow, omit the chilli and just use the chilli flakes. The ingredients list here might look long but I assure you, the majority of it will already be found in our store cupboard (especially if you’ve made some of my other recipes!!). Take a large sauce pan, pop on the heat and dry toast the cumin and coriander seeds for a minute or two until you can smell the gorgeous aromas coming off them. Pop in a pestle and mortal and grind to a powder. Leave to one side. Spray the now empty pan with 1kal, add the onions, garlic, ginger and chilli and fry for 5-6 minutes until the onions are soft (add a little water if the pan gets too dry). Next add the crushed cumin and coriander seeds, curry powder, turmeric, cayenne pepper, salt, cinnamon and crushed chillies. Fry for another minutes and then add the tomatoes, lentils and vegetable stock. Bring to the boil and then reduce to a simmer. Simmer for 40 minutes (or until the lentils are cooked and nice and soft), stirring throughout (otherwise the lentils tend to stick). Add a splash of water if required to stop the sauce drying out. Once reduced and thickened a little, add the coconut milk and spinach and keep simmering until the spinach is wilted. Season to taste and then keep the sauce warm whilst you cook the fish. For the fish, take a small bowl and mix together the butter, turmeric, garlic and coriander until well combined and soft. Rub over the flesh side of your fish fillets (not on the skin side). Season the fish with salt and pepper. Take a large frying pan, spray with 1kal and bring to a medium heat. Add the fish to the pan, skin side down and fry for 4-5 minutes. Turn over and cook for another few minutes (until cooked through or to your liking). This should give you a nice crispy skin and lovely tender fish flesh. To finish the curry, add the juice of 1/2 the lemon and the coriander. Stir. Then take a bowl, add the rice if you are having it and add the curry sauce on top. Finish by topping with the fillet of fish and serve with a small slice of lemon. Sorry to be a nuisance but when does the toasted cumin and coriander seeds get added, while the lentils are cooking? Making this just now and smells delicious. I made this as part of a family curry night last week and it was the star of the show!!! I’m about to make a huge batch to freeze and take to work as lunches. We used three of your lovely curry recipes for the party and everyone said how nice they were. Thanks. 90g Seabass fillets ate 4 sp each …. worth it though! Laura – this is Absolutely gorgeous in fact it is lush amazing!! Will definitely do this one over and over again. Hi I’ve made the sauce and going to have it with chicken breast. How many points would that be please. I know on Flex it would be free but I prefer the SP plan. This is a truly delicious meal, full of flavour and simple to make. Thank you, I’ll certainly be trying some of your other recipes. So glad you enjoyed Maya! Oh my god! Amazing! Thanks for this recipe. 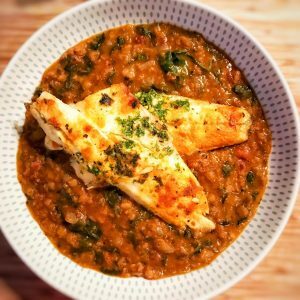 The lentil curry will be a staple for lots of dishes! OMG, just had this for dinner. Absolutely lovely – the best meal I’ve had since doing WeightWatchers! Had it with salmon and have enough left for lunch tomorrow. I’ve tried quite a few of your recipes and they’ve all been lovely but this is currently wearing the crown. I enjoyed this recipe but it was a little bit ‘hot’ for me, how would i make it not so ‘hot’? Have just made this, my first of your recipes and it was Lovely, did it with chicken. My husband was very sceptical but clear plates all round, will certainly be making more of your recipes! Just made this with cod fillets only one word delicious. Very filling and tasty you can taste all the flavours. Think I’ll be using lentils now instead of rice. Next to Malaysian stir fry this is my new favourite. This was delicious- used haddock instead of Seabass and courgettes instead of spinach ( just what I had in – everything else was store cupboard). We didn’t have the rice just to keep the points low and we didn’t really miss it. I will have a portion of the lentils by themselves for my lunch tomorrow. Spoilt for choice of which of your wonderful recipes to cook next, particularly like the Korean dishes. This was so good. A new favourite, husband has asked if we can have it again tomorrow. THANK YOU!